Played by Charlotte Abbott, Conlan Gassi, Connor Boa, Dennis Johns, Denver Milner, Sebastian Altamirano, Diana Bernasiewicz, Emrik Burrows, Felix Stueckmann, Jake Spencer, Jared Brown, Jennifer Gordat, Jordyn Taylor, Sydney Thompson, Leah MacDonald, Margarita Sanchez Leon, Mary Jane Walzak, Matt Green, Matt McCarthy, Melissa Metler, Neila Lawson, Rachel Weisdorf and Tara Gonder. Modern adaptations of classics of children’s literature can be a minefield, with sometimes jarring cultural attitudes or a numbing preciousness that has nothing to relate to. 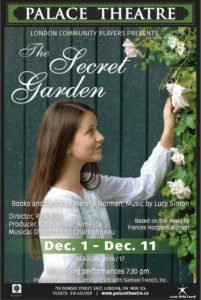 Thankfully, this does not apply to this play, which is tuneful and even moving story about a girl learning the power that can come from empathy and personal faith in an ideal guided with a little perspective. After being orphaned in an cholera epidemic in India, Mary is taken under the care of her troubled Uncle Archibald at his personal estate in Britain. With her uncle largely refusing to see her, Mary explores the estate until she finds boundaries and secrets she is determined to defy and learn. When those lines are crossed, she learns of the true sickness in that gloomy home, but finds friends ready to help her find true beauty and hope in the unlikeliest of places. For someone expecting the above stereotypes in a production based on an Edwardian era children’s novel, the story is much more engaging than I anticipated. While it does have elements reminiscent of Pollyanna and Anne of Green Gables , such as the basic plot of a young girl coming to a cold adult world and shaking it up positively, it has its own dramatic weight. For instance, the story has a charming magic realism that could be really supernatural in the story, but it is up to you decide how much that is the case. In that regard, making the story a musical is right in keeping that with that narrative spirit. Yet, for that suggested fantasy, it is artfully counterbalanced with the characters having a refreshingly believable realism for its literary era. For instance, Mary is prone to being highly reserved and presumptuous to others, but is allowed to lighten up as she finds something to care for in her new home. Likewise, the supposed villain, Dr. Neville Craven (ably played by Matt McCarthy) of the story is not truly evil, or even cruel, just misguided in his own definition of compassion. For a story from a literary era derided for pushing a rigid simplistic moralism, this kind of character complexity can really be a surprise. Complementing that is some fine performances that allow those nuanced characters hit home. For instance, Conlan Gassi is intriguingly soulful as Archibald as his personal bitterness wrestles with his better nature when Mary’s influence is able to spark the conflict. In comparison, Connor Boa is delightfully spritely with an elfin charm as Dickon who is able to provide a kind of magic of his own with only a staff and some clever lighting. Likewise, Melissa Metler proved a welcome mature kindheartedness as Martha gives the drama a solid foundation to help Mary and other principal characters to base their dramatic development. Dennis Johns plays off her charmingly well as Ben, an old gardener who is able to make the seemingly fanciful dreams of Mary and her new friends come true with a quiet expertise. Against that, Mary Jane Walzak is well suited as Mrs. Medlock, a cold housekeeper whose impersonal manner is simply in the service of keeping her job, even it is at the expense of humanity. As for the music, the songs are engaging enough, but only the Indian-influenced piece Come Spirit, Come Charm is truly memorable with its intriguingly suggested mysticism. Otherwise, the music has a certain anonymous sameness to it, almost to the point of becoming a drone throughout the production. Furthermore, while the live band is pleasantly tuneful, the fact remains that the Palace is apparently not suited to musicals as the singers’ voices tended to come off as distorted too often to becoming incomprehensible, especially in big numbers. However, the stagecraft is excellent in its efficiency. For instance, the static props are only some carefully built step platforms and a large wall for back projects to establish the various scenes’ settings. With that, the company merely has to move some select items like furniture to change scenes without closing the curtains. As such, the play’s narrative is allow to flow with little disruption and a steady pace for this seemingly leisurely story is assured. That is facilitated well with the gate of the Secret Garden itself, which is able to suggest a special world behind with only a door, some careful decoration late in the story and some well placed light. The costuming is similarly exquisite with a seemingly well-placed historical accuracy to establish the period with the right verisimilitude. There are some stories that cannot age, and some that are truly timeless. This play is an entertaining example of the latter and a pleasant surprise depending on your assumptions about Edwardian kids’ lit. This is a very meandering and odd synopsis of this play. Almost like Ken didn’t know the play won a boatload of Tony Awards when it debuted. I could list an overview of his review of this play, but frankly I just don’t really understand play reviews. Far too Edwardian. But man, does Ken ever drone on. And on. And on. I give this review 1.5 stars out of 5. Thanks for your comment, “PE”. It’s worth noting that the Tony Awards are given, by and large, for elements that are specific to a production; in this case, the “boatload” (of three) comprised an acting award, a design award, and best book; I think that final one, which is the only one that’s relevant to any other production, is well accounted for in Kenneth’s review. Please leave your given name and a valid email address in future comments. Being derogatory to a former Prime Minister on a theatre review is unnecessary. Thank you for the review. I am a member of the cast and, as such, don’t get an opportunity to enjoy the show from the audience point of view. Information regarding the background for the play and the times is a welcome addition to the review as it provides a context for an appreciation of the show. I have had a number of friends and family come to see the show. I asked their opinions on a number of points made in the review. Unsurprisingly, some agreed with the reviewer and some disagreed. Theatre is such a personal experience. My asking of the questions did provoke a valuable broader discussion of the show, some aspects of the script and directorial choices. Reviews are a valuable tool to allow us to see art through another person’s eyes. Thanks MJW. The great thing about opinions is that everyone has their own. 🙂 I’m glad Kenneth’s provoked some discussion!